Knockando Woolmill sits by a tree-fringed stream amid arable farmland in the northeast of Scotland, the heart of whisky country. In operation since 1784, it is the oldest continuously working rural mill in the UK. Today it produces knitting yarn, blankets and tweed cloth using machinery that dates back to the 19th century. 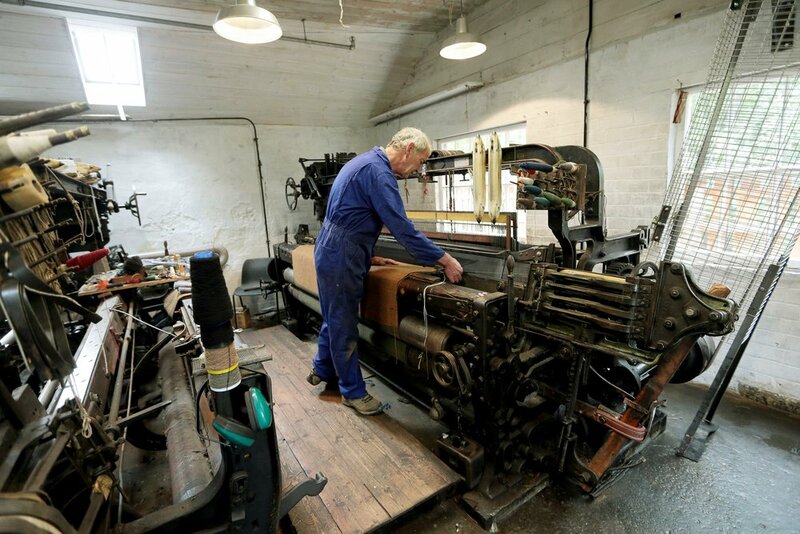 The mill was bought by its chief weaver Hugh Jones, together with two friends, in 1976. A teacher, he was on holiday in the area when he saw the mill for sale. He had no knowledge of weaving but was attracted by the machinery and the idea of making something useful. The mill owner Duncan Stewart, who was selling up after 50 years, taught him the basics over a two-year period. He also learnt from a loom mechanic at the Scottish College of Textiles. Originally managed as part of a croft, the mill was powered by a giant water wheel until 1949, when it switched to electricity. Local farmers would bring their fleeces to be converted into cloth or knitting wool. Combining farming and weaving made it possible for the crofters to eke a living. By 2000, the strain of continuous production had taken its toll on the mill. Hugh handed over control to the Knockando Woolmill Trust, which raised £3.4million for restoration. The machinery and the once ramshackle stone and timber-clad buildings were renovated. The work was completed in 2013 and the mill is now operating as smoothly as ever. “It’s a piece of history, the last one of its kind,” says Hugh. “My aim was to improve the working environment rather than change it. We’ve kept the simplicity of the place while making it functional today.” The equipment, including two looms from the 1890s, is housed in three old workshops with whitewashed walls and low ceilings. A new building is home to two additional looms. Hugh describes the process of turning sheep fleeces into fabric as a matter of “making order out of chaos”. When a sheep is shorn, its wool is a mass of greasy, matted, unruly fibres. By running the fleece through the mill’s carding machines, those fibres are separated and straightened ready for spinning and weaving. The fleeces used are bought in bales after they have been scoured (washed). Traditionally, the mill has used wool from Cheviot sheep which have a white, resilient coat. “The coarser wool from the older sheep mixed with younger wool makes a good tweed yarn. The younger wool makes soft blankets,” says Hugh. He looks for wool fibres that measure 2.5-4in (6-10cm) in length as this best suits the mill’s Victorian carding and spinning machinery. To produce yarn that can be woven on a loom, the raw wool goes through three main processes: teasing, carding and spinning. At Knockando, only the natural wool is processed in this way, with coloured wool yarns being sourced from other British mills. The wool is then conveyed into the carding machines. “Carding separates the fleece into individual fibres that are going roughly in the same direction. It’s like brushing hair,” says Hugh. The carding set comprises three machines with 5ft-wide rotating rollers covered in tiny teeth: a scribbler, an intermediate and a condenser. The set can process approximately 22lb (10kg) of fleece an hour. After the intermediate stage, the wool fibres emerge in thick continuous strands known as slubbings. These are wound on to balls and fed into the condenser, which thins them. The carding process concludes with the resulting rovings (unspun threads) being wound on to spools. “There’s no strength in them but the fibres are more or less regular. At this stage, some twist is inserted to get yarn,” says Hugh. The more twist there is, the tougher the material produced. Tweed, for example, which has to withstand the rigours of the outdoors, uses yarn with more twist than a blanket, which is soft. Next a warp is made from the yarn that will be tied in to the loom. These are the lengthways threads of a cloth. A blanket requires approximately 2,000 of these across the width. To keep all these threads under control, they are wound round tiers of pegs on a warping frame. If the finished cloth has a coloured pattern, the different coloured threads have to be kept together in the correct order. For manageability, the warp is made in two halves. Once Hugh has removed the threads from the frame in two long coils, they are passed through a set of pegs, called a raddle, on a warping machine. This sets the warp to the required width. For a blanket, the width is 78-80in (198-203cm). The machine chatters as the threads are wound on to a warp beam that will fit into the loom. The warp is then threaded through a reed, which resembles a comb that keeps the threads correctly spaced. The reed beats up or pushes the weft (widthways) thread into place during weaving. That apparatus is then set in the loom, where the threads are attached to a beam cloth that anchors them ready for weaving. Blankets are commonly woven in 2/2 twill. In this weave, one weft thread passes over two warp threads then under two warp threads and so on, creating a diagonal pattern. The reed beats up each new weft thread tight against the previous one to form the fabric. It is a noisy operation as the old loom clatters rhythmically at speed. The cloth is sent away to a textile finishers in Galashiels. Finishing involves washing, which removes the conditioning oil, and shrinking. “When it comes off the loom, it’s just a bunch of threads put together,” says Hugh. “When washed, the cloth shrinks as the fibres mill together.” If the cloth is being made into blankets, it is put through a teasel gig, a drum with barbed natural teasel heads that raises the pile so it feels soft. The raw edges are then blanket-stitched. After its refurbishment, the mill is now equipped to continue the cloth-making tradition that began at Knockando during the Industrial Revolution.